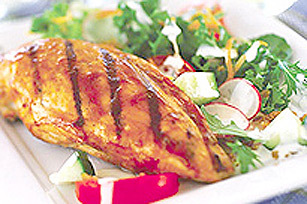 Grill up a classic with our All-American Chicken recipe. Just follow our two simple steps to grilled chicken deliciousness. Marinate whole, bone-in chicken breasts and legs (1 piece per person) in Kraft Original BBQ Sauce for minimum of 30 min., and up to overnight. Discard marinade after use. Grill and serve with extra barbecue sauce. Start with a basic green salad (1 cup per person) and then add a handful each of: tomatoes, cucumber, radish slices, grated carrots and Oscar Mayer Real Bacon Bits, then drizzle with Kraft Rancher's Choice Dressing.